A blog about toys and life... but mostly toys. Here's a big boy from the world of professional wrestling, the so-called "World's Strongest Man", Mark Henry. Does he hold up to the excellent quality of the Elite Collection, or is he just fodder for your custom DCUC Kalibak? Find out! First thing's first, Mark Henry is a very BIG man. This guy is damn near 400lbs! His figure definitely captures his proportions very accurately. It's a massive figure in your hands compared to the usual Elite figure. Mattel decided to use a smiling face scan to sculpt Henry's Elite figure debut. There's nice detail in the face and they did a really great job on his braided hair. His singlet is sculpted on and features a seam around all the edges, which unfortunately doesn't show up as well in the pics since his entire outfit is painted one solid color. Because of his size there are lots of unique new parts on Henry. I don't believe he shares any of his torso/legs pieces with any other figure in the line so far. Most of the parts on Mark are molded in the necessary color, as has been the practice with Mattel's WWE lines. His upper torso and thighs are molded in his skin color with red paint added on for the singlet areas. The paint matches the red molded areas perfectly. His articulation is for the most part the Elite series standard, however one point you may notice missing is the hinge at the shoulders. There's only swivels there, which limits a lot of the range in his arms. That's unfortunate and I'm not sure why Mattel did it. As you may expect, several of his points are limited by his overall size, but you can't fault the designers for that. He's a BIG dude! Depending on how you count this, Mark Henry basically only has one accessory. An Olympic-sized barbell. It's in pieces inside the box, so you have to put together. There's the bar, the two stacks of five 75lbs plates (they do not come apart) and the locks. It's a minor nuisance to put it all together, but once you do, HOT DAMN! You've got an action figure sized barbell set! If that sounds boring to you, then you have a pulse my friend. It's cool for one or two pics, then you realize: "it's useless". 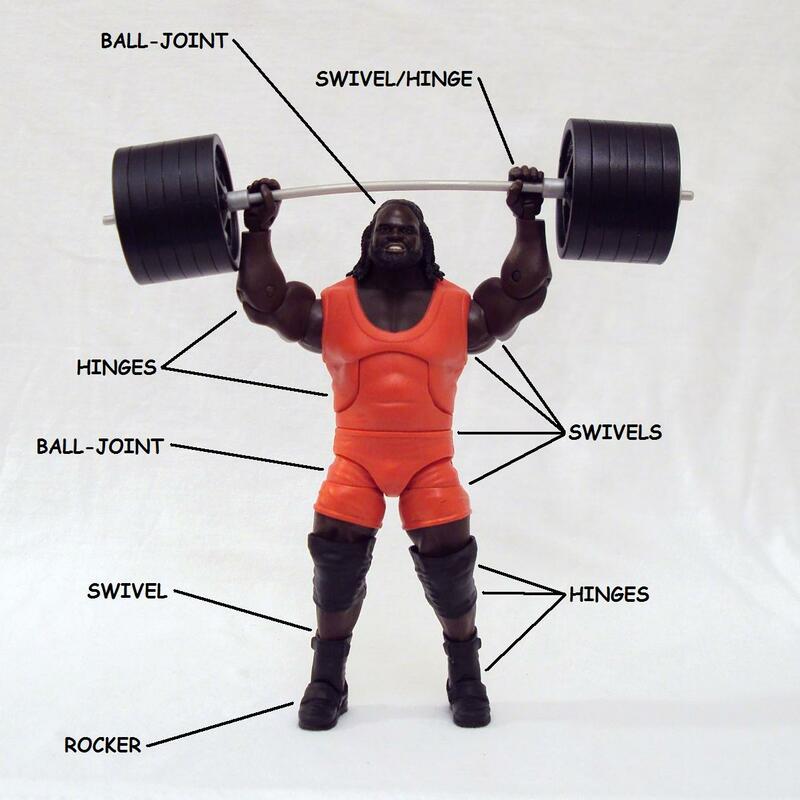 I was informed after my review, that Mark Henry does indeed feature swivel/hinge shoulders like other figures in the line. My apologies for the mistake. He's definitely a better value as larger figures within the same price range as regular-sized figures are. While I did return this figure after the review, I hope to pick him up again when possible. I have since added Mark Henry to my collection. © 2010-2013 3B's Toy Hive. Theme images by Ollustrator. Powered by Blogger.